This category, in the history of mechanical music, has a special place combining the clockmakers craft and mechanical inventions in order to obtain a musical pleasure. The first clocks linked to a musical system were church clocks with its bells, a system from Asia that arrived with the Dutch. 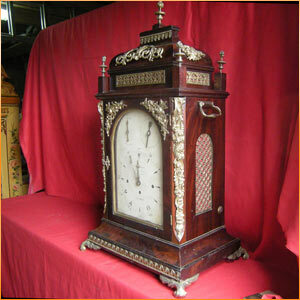 There are a wide variety of musical clocks from very sophisticated to very simple. Note the carillon clocks, very much in fashion in the 18th century. Sometimes accompanied by automatons, these were appreciated by English clockmakers who supplied the Asian and Oriental markets. We have, as well, the famous Black Forest clocks with automatons and flute music mechanisms. There are very few examples available to the general public. Most of them may be found in museums or in important private collections. Thanks to a worldwide network, we try to offer you a few examples. To end this section we highly recommend a captivating book: History of the Musical Box and of Mechanical Music by Alfred Chapuis. English edition - Musical Box Society International.